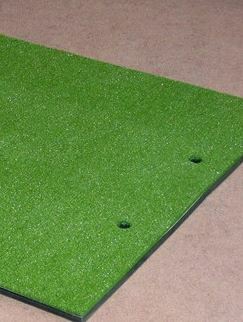 This is a popular mat, giving you all the feel and long life of a commercial winter tee mat with artificial grass on top of a 25mm rubber shock base, which is ideal for hard surfaces. This is a popular mat, giving you all the feel and long life of a commercial winter tee mat with artificial grass on top of a 25mm rubber shock base, which is ideal for hard surfaces. Perfect for the garden, we recommend this mat with the Tunnel SuperNet.